Over the years, the Fields Corner section of Dorchester has become a restaurant row of sorts for people who love everything about Vietnamese food. Pho Hoa and Pho Le on Dorchester Avenue and Pho 2000 and Anh Hong on Adams Street are just a few of a number of excellent Vietnamese restaurants in this Boston neighborhood that are definitely worth checking out. But one Vietnamese restaurant stands out in some ways above all the others, not just in Fields Corner, but in all of the Greater Boston area as well. That restaurant is Pho So 1 Boston, an unassuming little spot that is located in the heart of Fields Corner and more or less across the street from Pho 2000. 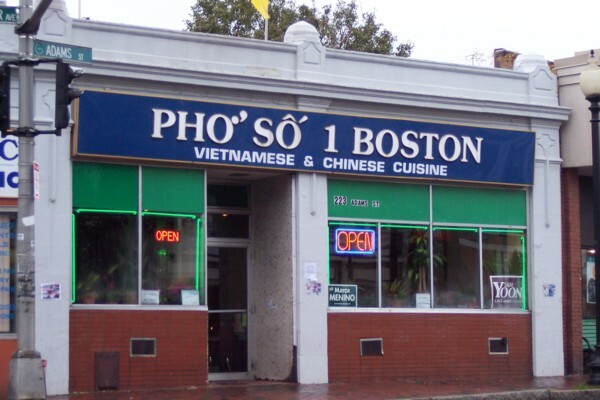 When the Boston's Hidden Restaurants site first discovered Pho So 1 Boston, few knew about it, other than people from the surrounding neighborhood and those in the know, including restaurant critics and knowledgeable food nerds. And while it used to be that on weekend nights, there was never a wait for a table, people have started to discover this restaurant and it isn't so quiet anymore. Diners have discovered another Pho So 1 in Randolph as well, which is apparently not connected to this one but it every bit as good, though the Dorchester one is obviously being better for those who rely on public transportation and the Randolph one (which may have been connected to this one at one point) being better for people who tend to drive more. The original Pho So 1 Boston in Dorchester has a simple layout, with a medium-sized room given a bigger appearance by the mirrors on the walls. The waitresses are friendly, though not all of them speak fluent English. As far as the food is concerned, Pho So 1 has some truly excellent dishes, including the wonderful wonton soup entree, which includes fabulous dumplings as well as tasty greens and pork slices. The steamed spring rolls, chicken vermicelli, and pho ga are also worth getting, as the ingredients used for all three dishes are fresh and healthy. And if you like bubble tea, Pho So 1 Boston, along with Pho 2000, has some of the best in the Boston area. Pho So 1 is well worth seeking out if you are a lover of Vietnamese food, but it seems that it may not be a hidden restaurant all that much longer because of the quality of the food there. It has indeed come a long way from its quiet beginnings in Fields Corner and continues to impress year after year. Copyright © 2005-2015, Boston's Hidden Restaurants (www.hiddenboston.com).